The Depts. 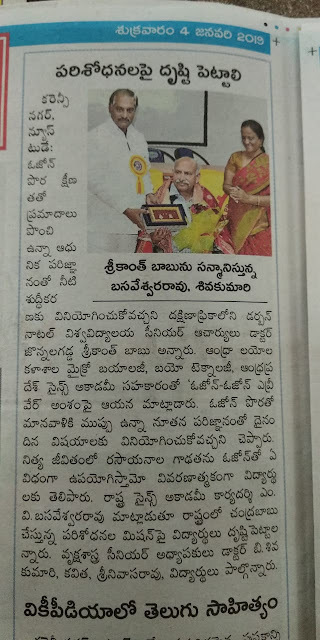 of Microbiology and Biotechnology organized a DBT sponsored invited talk in collaboration with APAS (Andhra Pradesh Academy of Sciences) on "OZONE, OZONE- EVERY WHERE" by Dr J. Srrekantha Babu, Senior Professor, Dept. of Chemistry, Durban University, South Africa on 3rd Jan, 2019. Prof. M.V. Basaveswara Rao, Honorable Secretary, APAS, Dean of Sciences Krishna University, Faculty and Students were present. IT IS MY RESPONSIBILITY TO MAKE STUDENTS MORE ENTHUSIASTIC.